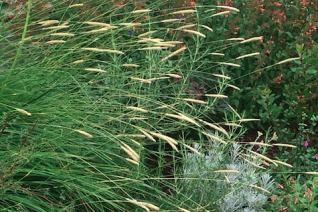 Veldt grass from South Africa has easily turned into one of our favorite ornamental grasses. Spreads to form bright green evergreen foliage that rises to 20″ tall and spreads several feet wide. From late spring to early autumn a continuous supply of 3′ – 4′ stems that have a catkin like inflorescence at the tip. It begins white and slowly turns to to tan. They wave gracefully in the wind and point in every direction from the clump. Immensely graceful grass that has an incredibly long season of interest. Rich, well drained soil with little summer water once established. Remains good looking through winter. Cold hardy and easy for full sun. Creates and excellent instant meadow effect. Evergreen. Moderate deer resistance.